Thimphu, 18 March 2018: The Bhutan Trust Fund for Environmental Conservation (BTFEC) will grant Nu 2.959 million to Bumthang Forest Division, DoFPS, Ministry of Agriculture and Forests, for environmental conservation project titled Conservation of Black-necked Crane (Grus nigricollis) for Chumey and Tang, Bumthang that will be implemented between July 2018 and June 2021. 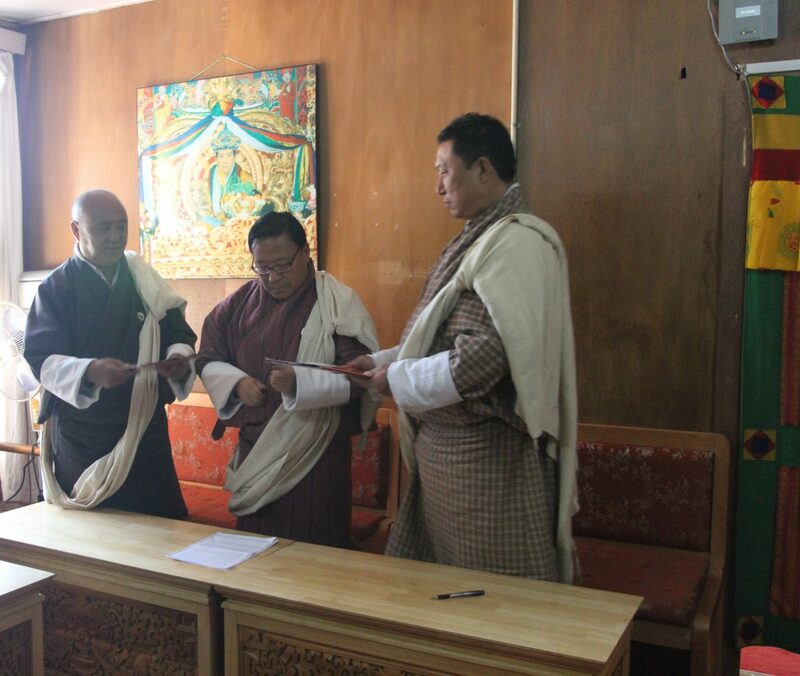 The grant agreement was signed in Thimphu today between BTFEC, GHN Commission and the grant recipient. The project aims to validate conservation priorities and challenges in the Black Necked Cranes (BNC) habitats; strengthen human resources to facilitate in the management of its conservation; and develop Black Necked Crane conservation plan. Except for Phobjikha, records maintained by RSPN, shows declining population of Black Necked Cranes in its other winter roosting sites. The decline in the number is attributed to loss of habitats and shortage of food, threats from developmental activities, social threats like stray dogs, and lack of conservation action plans in these sites. Black Necked Cranes reside in Bhutan from late October to mid-February. Their major habitats while in Bhutan are Phobjikha and Khotokha in Wangduephodrang, Bomdeling in Trashi Yangtse, and Gyatsa in Bumthang. While the population is increasing in Phobjikha, as per the RSPN records, it is decreasing in all the other habitats. According to the Bumthang Forest Division, the roosting and foraging habitats of the cranes in Bumthang, Wangduephodrang and TrashiYangtse have never been studied and their habitat requirements area unknown. Lack of information on the habitat requirements of BNCs in Bumthang is mainly due to unavailability of fund and support for research. Without a proper management plan in place and reliable funding for such activities, obtaining concrete information about the habitat ecology in these areas will always be a challenge. Out of five roosting habitats currently used by BNCs in Bumthang district (two sites in Chumey and Tang Geog and one site in Chhokor Geog), one site located in Chhokor Geog falls under the jurisdiction of Wangchuck Centennial National Park and the remaining four under Bumthang Forest Division jurisdiction. Currently, there is no specific management plan and informed intervention from Bumthang Forest Division as well as other agencies apart from status monitoring by the Forest Division, which is sent to RSPN for compilation on annual basis. The Department of Forests and Park Services has identified three programs for the 11th five-year plan, that it would achieve conservation and management of wetlands, conservation of endangered and endemic species and human wildlife conflict mitigation measures and conservation of biodiversity in general. This project entails the conservation of Black necked Crane, a schedule I bird species. In December 2015, a Black-Necked was found dead in Uruk valley under Bumthang Forest Division, later in mid-February a lone BNC was found injured. Recent reports from UWICE and RSPN states that no subsequent improvement in BNCs visiting Bumthang valley was observed. Despite their declining visiting population and charismatic importance, until now there is no concrete management plan in place for sustainable conservation. Through this proposed project, Bumthang Forest Division will develop conservation action plan for BNCs, improve habitat, involve communities in conservation, and improve monitoring and management capacity. In addition it will explore sustainable farming techniques in line with conservation to improve the arrival of BNC. Bumthang Division will collaborate with RSPN who have done spectacular job in Phobjikha conservation area, in getting guidance and advice on making similar success in conservation in Bumthang. 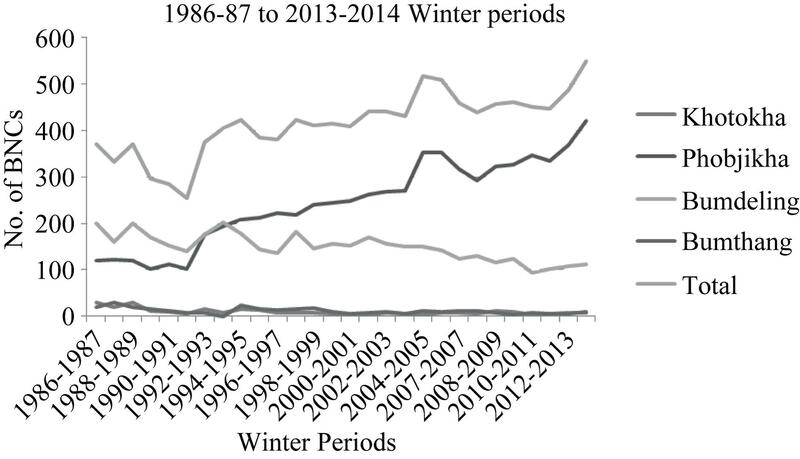 A paper published by Tshering Phuntsho and Jime Tshering, 2014 shows steady decline of BNC visiting Bumthang between 1986-2013. Till now, range offices in Chumey and Tang monitored the BNCs with limited resources at hand, to the extent of having no binocular to observe. The forest division, were able to chase dogs, conduct castration and convince locals in conservation. The ownership of the land used by the BNCs as roosting ground in Chumey and Tang falls in government reserve forest, government land, and private registered land. Moreover, in order to address to human wildlife conflict, farmers have taken into different types of fencing as preventive measures against wildlife conflict in their crops which may have negative impact on decline of BNC; although it’s empirically inconclusive of whether the farm fencing have any correlation in decline of BNC. Therefore, without proper management plan and relevant study, coordinated conservation intervention in these areas is challenging.